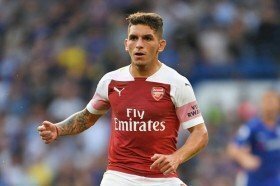 Arsenal manager Unai Emery has praised the qualities of Lucas Torreira on both sides of the field after his match-winning strike against Huddersfield Town on Saturday. The Gunners appeared on course for a frustrating goalless draw against David Wagner's side in the Premier League before Torreira's close-range scissor kick found the net in the 83rd minute. Speaking after the game, Emery was pleased with the midfielder's quick interpretation of play for the Gunners in both attacking and defensive situations. "His interpretation on the pitch, tactically, in attacking moments and defensive, he’s very fast in his mind and his feet. He can do very good work in defensive moments and like today and last week get into the box and score," he told BBC Sport. With the 1-0 win, the Gunners temporarily moved to third in the league standings before they were leapfrogged by Chelsea, who bagged a surprise triumph over Manchester City. Emery's team could potentially drop further down the table to fifth, should Tottenham Hotspur secure a triumph over Leicester City on the road in the late league kick-off.